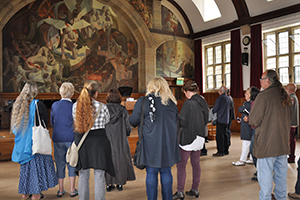 A previous tour view Ed Povey’s Hall of Illusions mural in the University’s Neuadd Powis.Guided tours of Bangor University’s Art and Ceramic Collections will be held between February and May. The aim is that tours will raise awareness of these important collections, with highlights including a mural by Edward Povey in Powis Hall, art and ceramics in the University’s Council Chamber Corridor and a chance to see and learn about works of arts by other renowned artists such as Kyffin Williams, Brenda Chamberlain, Peter Prendergast and Frederick William Hayes. As well as the general tours that will be held in February and April, there will be an opportunity to attend tours led by specialist guest tour leaders. In March David Roberts, the former registrar of the University will lead tours on ‘ “A Lasting Mounument” : the design and history of the University’s Main Building’. In May artist Jeremy Yates will lead tours on the subject of ‘The Art of Giving’ concentrating on sections of the collection. The guided tours are part of a joint venture with Gwynedd Council to increase access to Bangor University’s hidden museum collections as part of the “Engaging Collections: Widening Access to Gwynedd’s Heritage” project that is partly funded through the Heritage Lottery Fund. This will offer local residents and visitors a chance to enjoy and learn about the vast variety of objects on display. The guided tours will start from the foyer of the Main Arts Building, College Road, Bangor on Saturdays 27th February, 26th March, 23rd April and 21st May. English tours will be held 11.00am-12.00pm, 2.00pm -3.00pm and in Welsh 12:30pm-1:30pm on these Saturdays.